Egyptian President Abdel-Fattah El-Sisi has said that pushing ahead with reforms of the African Union and promoting unity between African states are his top priorities as he takes the helm of the 55-member bloc. El-Sisi took over the rotating post of head of the AU from Rwandan President Paul Kagame at the start of a two-day summit in Addis Ababa. As chair of the African Union, "Egypt will work hard to continue the path... of institutional, structural and financial reform of the Union, and complete achievements realised... to develop the capabilities of the Union and its Commission to meet the aspirations and hopes of African peoples," El-Sisi told African leaders after his inauguration on Sunday. Promoting joint African action is a formidable task Egypt will take on, compounded by problems in the continent including armed conflicts as well as terrorist attacks and extremist violence, El-Sisi said. During his speech, El-Sisi called on African leaders to work together to achieve economic and social development in the continent. He said that this can be done through promoting African integration by developing infrastructure and promoting cross-border projects. El-Sisi also said that this can be achieved through offering greater job opportunities for African youths and speeding up the formation of the Continental Free Trade Area (CFTA), which aims to bring together all African Union states into a single market. The CFTA was agreed on by 44 states in March 2018, but only 19 countries have ratified the agreement. Intra-African trade is low, constrained by problems in the continent including armed conflict and a lack of transport connections between countries. El-Sisi said that boosting African peace and security and post-conflict reconstruction will continue to be among the organisation's top priorities during his tenure. The president urged African leaders to adopt a developmental approach whereby mega projects are carried out to offer job opportunities for African people and help curb an influx of refugees. The issue is directly linked to the AU's 2019 theme of "Refugees, Returnees and Internally Displaced Persons." According to the United Nations, developing countries, mostly in Africa, are taking in 80 percent of the world’s refugee population as off 2017. 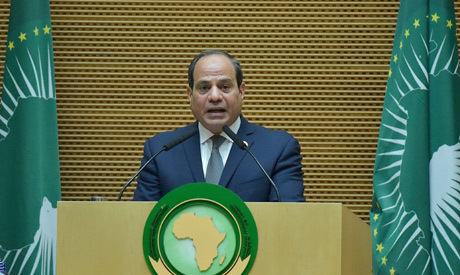 El-Sisi emphasised the importance of establishing the principle of what he called "African solutions to African problems," warning against external intervention and modern patterns of exploitation.